A sudden and dramatic breakup of Great Bear Lake had people in Deline, N.W.T., running to rescue their boats and Ski-Doos as strong winds caused ice to surge onshore. Warehouses along the shoreline were lifted and moved and teepees were damaged by the powerful ice movements. Paulina Roche heard about the ice over the local radio network after getting home from work Thursday and rushed to help her brother. "I heard my brother Charlie, who lives on the other end of town, I heard him on the radio saying the ice was coming toward his warehouse and he needs help trying to move some stuff," Roche told CBC. "You can hear people talking on the radio 'Yeah, you've got to move your boat' and somebody says 'You gotta' move your Ski-Doo!' and 'We need help over here.'" She headed out with her husband to her brother's and saw the ice coming in, heading toward the government dock and the water treatment plant. She said the municipality dispatched two bulldozers "ready to fight that ice" to protect the water treatment plant from damage. "The ice had already stopped by the time we got there, but it kind of lifted one of his warehouses and pushed it all against his other one." She said his neighbour's entire yard was filled with ice. "She went into her house for not even five minutes ... and she came back out and here was her warehouse all lifted by the ice. She said it happened so fast. People were panicking, thinking the ice was going to keep moving in, but it stopped." 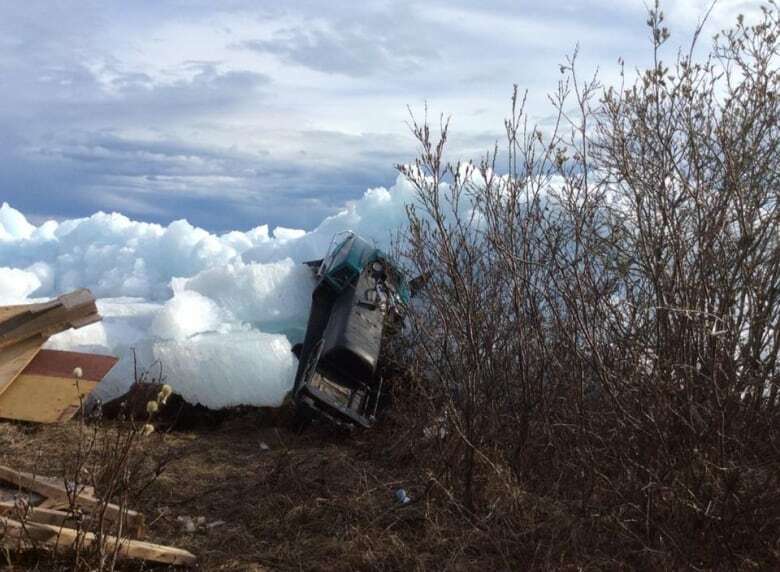 The ice is still there but damage was limited to a few structures, such as her brother's teepee, and the ice spared the teepees by the house of the Prophet Ayah, a Dene prophet and spiritual leader, she said. "I've never seen something like this before; I've lived here for all my life and I've never seen the ice move up so fast and so high," Roche said. "This happened Thursday; people were ice fishing Wednesday. One Ski-Doo was still on the ice even as the ice was moving, it's still sitting there. Unbelievable."